how i made a doormat with those straw trivets | i made it so. you know the ones i mean. * i need a better way to keep track of cool things i come across. bookmarking isn’t cutting it. suggestions? tumblr? so i started wondering if i could take that idea and put it to use elsewhere. 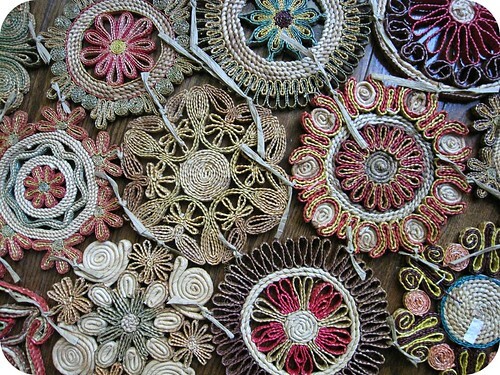 i like the colours and swirls found in these old trivets, there’s something intriguing and pleasing about the patterns. i got a bagful of them the other day, and thought about how to connect them together. i figured i could sew them together with clear plastic thread. but decided against that and tried to keep it a bit simpler and closer to the “natural” materials used in the trivets by using raffia instead. 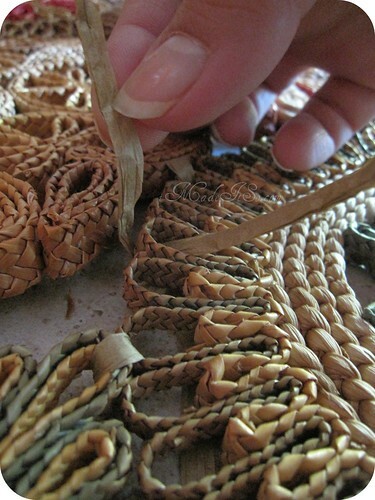 raffia is made from the membrane found on the underside of palm tree leaves. there are so many uses for it, and i keep a spool of it in my kitchen drawer. you might remember it was used as a decoration on that card, as well as to tie up those herbs. 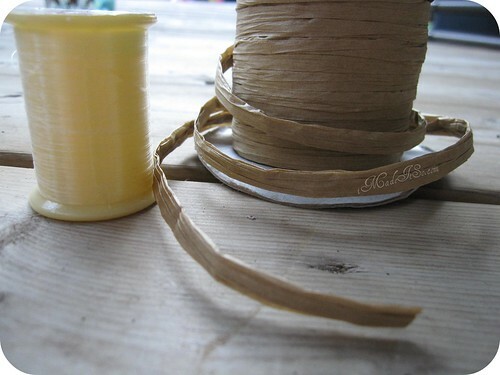 i cut the raffia into 5 inch (about 13 cm) strips, roughly. now the next part is either fun or torture, depending on how much you enjoy things like jigsaw puzzles. i moved the trivets around until they were in position next to each other, ideally touching each neighbouring trivet in one or more spots, while minimizing the gap between them. basically, shift em around til you’re happy with the layout, making sure they’re all touching, then start tying them together right where they lay. and that’s it. i flipped the whole thing over, and i had this funky looking floor mat. i considered using it in the kitchen, but the straw is a bit rough on bare feet. so i put it out back on the patio and i’m using it as a doormat. i like it so much. the colours, the patterns, everything. fun, easy project which is totally functional. now if you’re concerned about how it will feel under foot or worried that it may not last, the same construction method can be used to create a decorative wall hanging, placemats, table runner, a mat for underneath plant pots or pet dishes or… do you have any other ideas? what do you think? will you give this a try? if you do, let me know how it turns out. i’d love to see photos! today, this project was featured on craft gossip (thank you!) and i thought i’d give an update on how it’s holding up now, almost a month later. we’re in and out of that doorway constantly, and it has held together well. one thing i would recommend is placing one of those rubber underpads (you can find them in the dollar store, the kind used to line drawers and such). depending on the surface you’ve placed the mat on, it can be slippery. craft safely ;-) and have fun with this one! i shared this post with sarah and her readers at thrifty decor chick. 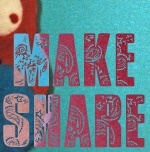 and also apron thrift girl’s new feature, make share! © imadeitso, 2010. Unauthorized use and/or duplication of this material without express and written permission from this blog’s author and/or owner is strictly prohibited. Excerpts and links may be used, provided that full and clear credit is given to ana at imadeitso.com with appropriate and specific direction to the original content. 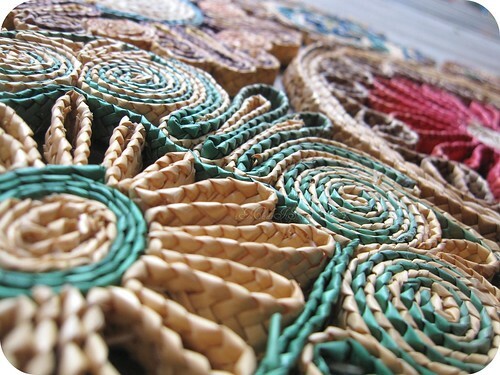 This entry was posted in around the house, ideas & inspiration, something old, something new, thrifting & vintage and tagged decor, doormat, floor mat, raffia, straw trivets, trivet, what to make with trivets. Bookmark the permalink. LOVE that! I want to make one someday. Where did you get the trivets? Very cool! I’ve been trying to think of something other than a wallhanging…I didn’t want to use mine for that either. Just couldn’t picture it hanging on a wall somehow. I think I’ll try it but it may be awhile before I’ll get to it. Keep me posted on durability- I’m curious to see if they hold up. It is GORGEOUS! What a beautiful little collection of trivets. Brilliant Ana … looks super! Don’t make me start collecting trivets heehee! That really is one fine trivet collection, repurposing at its finest. This is such a great idea! I see trivets like these at the thirft often and never buy them. It turned out beautifully, the designs and colors, it looks as though it had been made that way. You’ve got my creative buzz going – I will have to try this too! thanks halima. if you try it, let me know how it goes! I’ve always loved your projects here, Ana, but this one might be my favorite. Really gorgeous! (And I could use a new doormat….) And your photos are perfect, too. Love the angles. Thanks for sharing! Very cute idea – and now you know it is all your own. I too am not the organized person I could dream of being. I started with bookmarks, then went to desktop icons, began blogging and now have a sidebar full of places I love to visit. All I could suggest is keep at least 2 days history of sites visited. I go in and delete a couple times a week. At least it is a start. Right now I am working hard to make a memes link page and have added some favorite home tour links and party links there as well. (As if I have time to revisit my favorites.) I am hoping this will work and inspire me. This is pretty awesome! I would love to do something like that on my walls like you were talking about. I don’t like a whole lot of clutter either but my walls are still completly bare and we have lived there for almost a year! Now, I just need to find some straw trivets… hmmm…. have fun. it reminds me of a quotation from one of my favourite writers, that nothing inspires her with more terror than an empty page. i think the same may be true with decorating and putting things up on the wall. a blank space can be intimidating, but once you get going, it can be a lot of fun. enjoy the process… and thanks for dropping by. 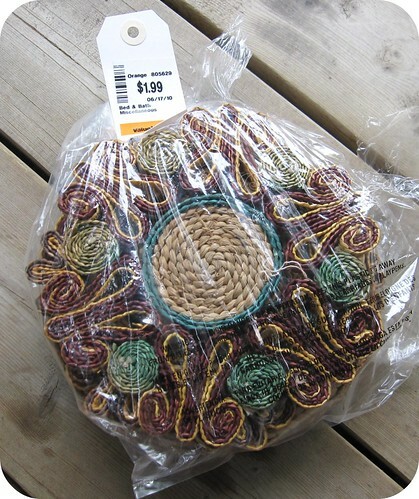 I have a bunch of these trivets and am going to try this–I love how it looks! That is brilliant. You amaze me. My doormat is sickly. It used to be a pretty green colour with white daisies and a green background. My friends and family thought I was crazy when I was in search of the perfect doormat last summer. (Found it in Stratford). I don’t want to throw it out because it’s still serves its purpose, but I could use a crafty idea for bringing it back back to life. It’s one of those heavy hay-like ones (I’m sure there’s a name for these mats). The design is still in the background and I could probably trace it on again, but what kind of paint do I use that is safe and won’t get tracked indoors? 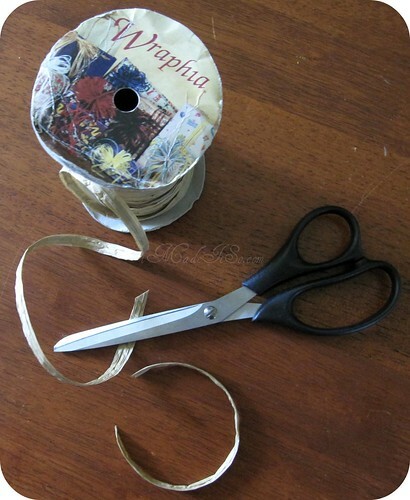 Or, do you have another crafty idea for bringing it back to life. I know you do! PS-Have you tried delicious for bookmarking? It’s really easy and a great way to share good finds. let me think about it tara… i’m sure there’s something you could do. i’ll look up delicious soon, alongside tumblr. thanks! i LOVE it!!!!!!!!! what a brilliant idea, lucky you to find so many! this is lovely! it resembles something you’d find for an enormous price at anthropologie. LOVE love it. Exactly what I thought. Totally looks like something anthro would sell. I love it! I wonder how hers is holding up or if it falling apart by now. I am going to make some of these! Thanks for this awesome article! it may take you a while to get enough to build a house ;-) have fun! Positively brilliant….out I go to look for some! Pingback: a feature, a thank you, a bumper sticker and a few things i’m being forced to share. | i made it so. I think I’m in love. Truly beautiful. i love this! its wonderful. I’m heartbroken. 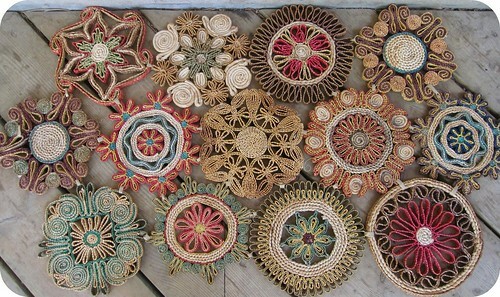 I collect old woven straw trivets and to see these used in a way that they become ephemeral hurts. 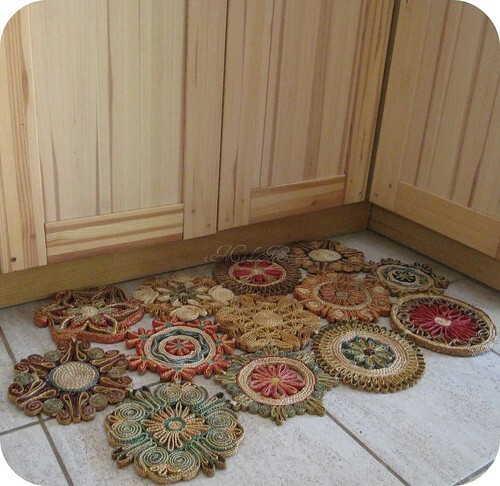 I use my trivets as decor around the top header of my kitchen above the cabinets. They are seperated by sets of different kinds of spoons that I have collected (wooden ones especially). 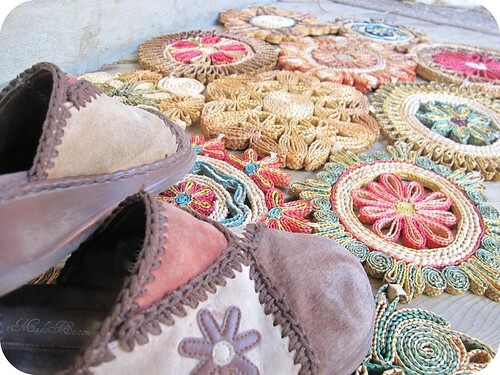 They add color and are a reminder of the past. I can understand if you got these new from a store how you could use them but they are so beautiful that I wouldn’t want them subject to weather or foot abuse. They will eventually disintegrate. Lovely mat though. hi gaea, i’m sorry you are heartbroken and that you’re hurt. for anyone who knows me, i think i am very respectful of the past and if you look around my house, there’s very little that is “ephemeral”…i’m hardly one to catch onto the latest fashion and exploit it as a passing fancy. these trivets were bought second-hand, and if you could see some of them closely, you’d notice burn marks and grease spots from years of use. they were sitting bundled in a plastic bag, and i passed by them untouched for a number of weeks before deciding to turn them into something “new”. as i worked with each one, i wondered about who had used them, what meals they’d prepared, what their lives were like. but i’m like that with any object from the past, as i mention in my “about me” page. true, perhaps a collector such as yourself would have found them and made better use of them and given them the respect you feel they deserve. and with all that being said, in all honesty, i think i’d feel a little like you if someone had taken something i collect and cherish…say a favourite dish…and smashed it to pieces to use as jewelry findings and such. so…thanks for sharing your perspective. What a wonderful idea. We use that kind of trivet still for our hot dishes, but I love the idea of creating something else from such pretty things. I do think this would make a great piece of wall art too. Pingback: audrey o’clock ~ featured on “better after” | i made it so. Pingback: 2010 in a nutshell… | i made it so. At the moment it’s invitation-only, but there is a link to request one on the site, or I could send you one. What a clever idea for these!!! I was just about to sell a set of three of them in my Etsy shop and wanted to know what people were calling them! :D Through internet browsing I came across your cute blog! 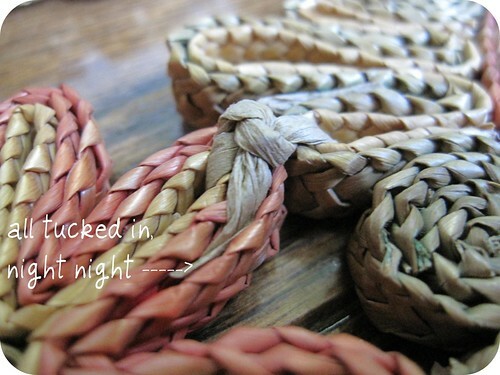 Pingback: you made it so: vintage trivet wreaths by corey | i made it so. Thanks, I do machine embroidery. How do you clean it? Does it make a difference in the life of the mat? dry sweeping and a gentle shake out is best. it’s true, it will deteriorate over time, moreso if it is used often in areas of high traffic and if left exposed to the elements. 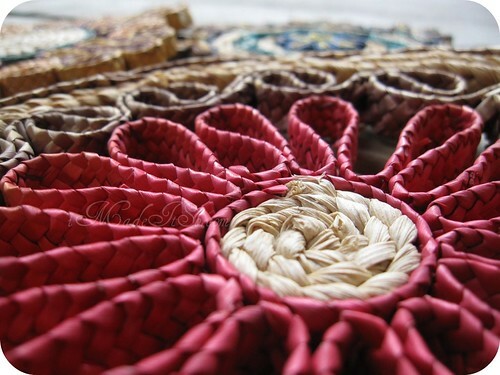 others who have similar concerns chose to make it and use it as a decorative placemat or wall hanging. I am IN LOVE what you have created with this amazing mat. I am planning on making some myself as gifts for family. I have already bought over 30 trivets in various places so I can do it. You are an inspiration! I was curious, though, how has your held up? Also, what would you think about scotch guarding it to protect it more? Thanks for this great article. You are so creative!